Demetri Martin has become known for something quite specific during his 20 years as a stand up comedian. His act is characterised by one-liners and short jokes as well as amusing illustrations and the regular inclusion of guitar. But that’s not to say Martin lacks adaptability. Over the years he’s worked as a writer for Late Night with Conan O’Brien and The Daily Show, created two seasons of the Comedy Central show, Important Things with Demetri Martin, released three illustrated books, acted in various films and TV shows and, a couple of years ago wrote, directed and starred in the feature film, Dean. The American comedian returns to Australia this year with his new stand-up show, Wandering Mind. Music Feeds speaks to Martin about his creative process, switching between disciplines and how he feels about his career. Music Feeds: Wandering Mind is your first Australian tour since 2011. Last year you released the Netflix special The Overthinker. Is it a lot of the same material in this show? Demetri Martin: It’s all new material. I try to experiment and improvise and have fun while I’m touring. I try to remember not to be so type A about it, but I was an A student and a real nerd about everything when I was a kid, so it’s hard to escape your instincts. I have to force myself not to be so utilitarian about everything. MF: You’ve got a tightly organised writing method that involves starting with pen and paper then typing ideas into the computer, printing them, binding them and filing them away for future reference. Does that stem from the same impulse? DM: I was more haphazard about it when I stared. There were napkins and scraps of paper and receipts when I was younger. Then I started to realise, you know if I could be a little bit more organised it might make my life a little easier. I remember reading this quote – Flaubert maybe – it was something like, “Be regular and ordinary in your life so you may be violent and original in your work.” I don’t know how violent or original I am, but do take the note. Once I got it to where I write in these certain note books and can put them in binders, I spend a lot less time looking for stuff. MF: Aside from injecting order, what sort of impact has this system had on your creative process? DM: One thing I did learn along the way was if I did the best I could to not judge myself too harshly when I’m generating ideas and material, because I don’t want to extinguish something that might be good. What’s been nice is now so many years later I have a lot of those notebooks and records so I can go back. It’s painful. I just read pages of terrible jokes and stuff that doesn’t make sense. But sometimes I’m like, hey wait a minute, maybe this is a joke. It’s like my past self is brainstorming with my present self. MF: You’ve been doing stand-up comedy for 20 years. You’ve worked as an actor, written for TV shows, made your own TV show, released a few books, and made the film, Dean. Do you still define yourself as a stand-up comedian? DM: Yeah I think I’m mostly a stand-up. It’s certainly how I feed my family and myself. It’s like, I’m a stand-up comic, but I want to make films and I’m learning it is hard to do both at the same time. There’s a zero sum game if I want to do either of them well. Making films is such a large undertaking. It’s cool, I hope I get to make a few more films, but I learned there’s more inertia there. It feels more permanent when you have it on film and someone can just go find it and watch it. Whereas when you’re touring there’s a transience to it that feels a little less daunting. Either way it’s a quicker feedback loop with stand-up. I can try new jokes, I can improvise and my agent can say, “hey you want to play here?” and suddenly I’m on tour. MF: You’re known for one-liners and illustrations and for often playing guitar during your shows. These are the things people love about your work and why they come to see you. But have you ever felt trapped in that frame because of the popularity it’s brought you? I’d done different bits, these drawings in this one down town room in New York and tried the guitar, so I put it all together and I did that special. But then I went back to touring the way I always did which is just telling jokes. And then after the shows people would say, “Where are the drawings? You’re the guy with the drawings.” So that was the first time I felt like I’d created a bit of a constraint for myself. But then over the years I started to appreciate it, especially when I started doing theatres and I’m doing 90 minutes. It’s more fun for me to have segments. On a bad night it feels like I’ve created constraints, but on a good night it feels like I’ve given myself a bigger box to move around in. MF: You’ve largely refrained from doing topical material or material with conspicuous emotional depth – there are implications, but you’re not doing shows about grief or depression or civil injustice. Do you feel those things are out of bounds for you? DM: I don’t know what my role is, but I stand more in the category of distraction, which I’m fine with. Maybe as part of a balanced comedy diet you need it. I appreciate and enjoy some of my friends who are political comedians, but I do get exhausted generally these days about politics. I find it upsetting and also very frustrating. But I also don’t believe in complete denial or withdrawal. That doesn’t seem so productive. I don’t think I’m really going to change anybody’s perspective and I don’t usually get too much clapter. It’s more daydreaming, joke-based, playful, and a little bit absurd. 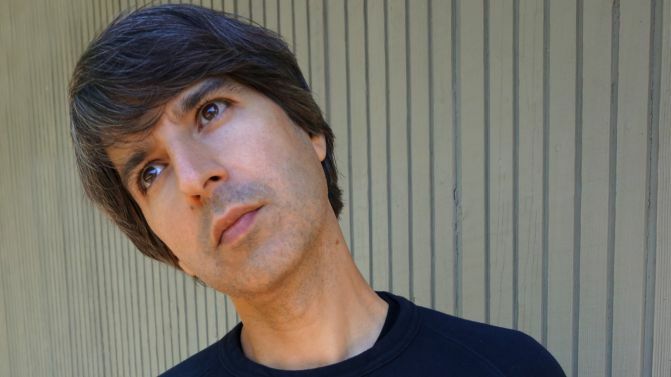 Demetri Martin will head to Australia this June for six shows nationwide, in Adelaide, Gold Coast, Melbourne, Sydney, Canberra and Perth. Head here for dates and details.